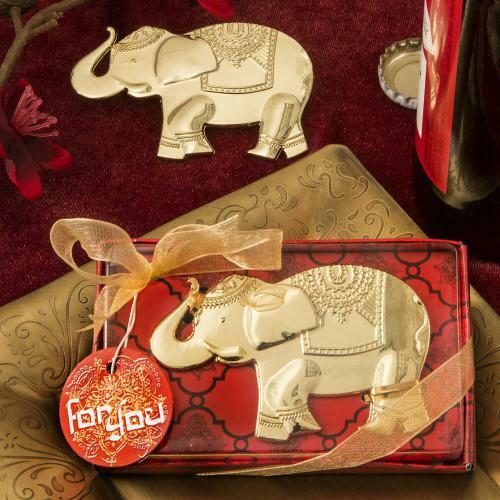 This traditional Good Luck elephant is crafted in solid caste metal plated in a luxurious metallic gold color. The elephant has a classic East Indian design and wears an ornate headdress, carpet and ankle decorations that are molded into the caste metal. The trunk is up - signifying Good Luck. The elephant is cleverly designed so that between the legs is a full functioning sturdy bottle opener that is well hidden in the ornament. Every special event needs to be blessed with Good Luck and these little elephants comes with loads of luck for all. Size 3" x 1 3/4"